Robert and Thomas Addis Emmet were two leading figures of the United Irishmen around the time of the 1798 Rebellion. They were the architects of what became known as the ill-fated “Emmet Rebellion” of 1803. Thomas had fled to France after the 1798 Rebellion but his brother Robert remained in Ireland to rouse what was left of the United Irishmen forces in preparation for a second attack on English rule in Ireland. Thomas petitioned Napoleon for French support of the Irish insurection and had won the promise of a French invasion to supress English rule in Ireland. Unfortunately, the arms stash being built up by Robert Emmet and his followers was discovered forcing an early start to the 1803 rebellion. Without the support of Napoleon and his forces the Emmet rebellion was doomed to failure. 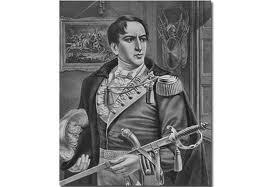 Robert Emmet was arrested by the English in the Summer of 1803 and hung on the 20th of September outside Saint Catherine’s Church on Thomas Street in the heart of Dublin. Thomas later fled to the United States of America where his family stayed until the early part of the 20th century when they returned to Co. Wicklow in Ireland. Today, the descendants of Thomas Addis Emmet live at Altidore Castle just outside Roundwood in Co. Wicklow and the current head of the family, Philip Emmet attends an annual memorial to Robert Emmet at Saint Catherine’s church on the 20th of September.